Wave Rock, southwestern Australia: 14-15 meters high, 110 meters long. This feature is on the north side of "Hyden Rock", a hill made of granite. The hill is an "inselberg" (also called a monadnock), an isolated small mountain rising from a virtually level plain. The word "inselberg" comes from German and means "island mountain." They are common in Africa. The indigenous people of south western Australia are the Ballardong people. In their Dreamtime, the rock was created by the Rainbow Serpent after she drank all of the water in the land. 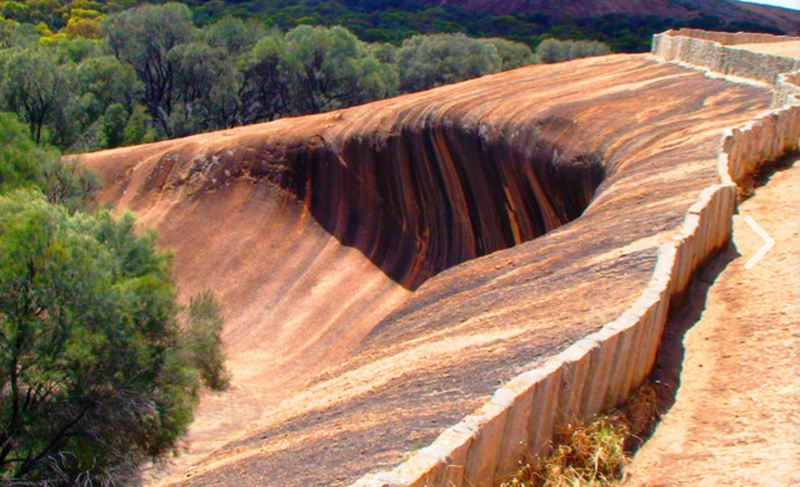 She became bloated and dragged her swollen body over the land, leaving Wave Rock in her wake. The dreaming trail of this story extends from the south coast near Augusta to the northeast to the Great Victoria Desert. underground pods or domes of solid unweathered granite separated by deeply weathered fragments of granite. Erosion then exposed these domes to become what is now Hayden Rock. 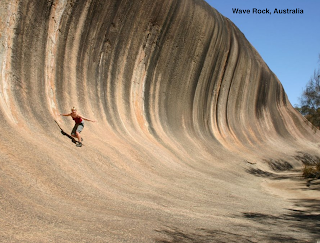 Geomorphologists call features like Wave Rock a "flared slope,"a bedrock surface that is concave-upward. Chemical weathering around the base of an inselberg preferentially develops at the base, producing a weathered and disaggregated zone. When the land surface around the buried inselberg is then exposed as the land surface is lowered, this disaggregated zone is easily eroded, leaving the flared slope of Wave Rock. A wall on top was built in the 1920's to guide rainwater (in this very arid area) toward the Hyden Humps Dam.